Past Senior Range Officer, Rampart Training, Inc. Custom Handgun Training. Training is developed based on client's goals. Training is begun at client's current skill level and progresses through simple concepts and techniques through more difficult. This training is great for beginners wishing to learn and develop safe and effective skills as well as expereienced shooters wishing to learn more advanced skills or simply "sharpen the edge." Targets included. Hearing and eye protection available. Price is by the day; training is also available by the hour. Don't be fooled by the affordability - this is competent, professional training built on many years of instructor training and experience! This is simply a 4 hour session as opposed to the full day. Training is developed based on client's goals. Training starts at the client's current skill level and progresses through simple concepts and techniques through more difficult. This training is great for beginners wishing to learn and develop safe and effective skills as well as expereienced shooters wishing to learn more advanced skills or simply "sharpen the edge." Targets included. Up to 100 rounds provided. Hearing and eye protection available. Price is by the half-day; training is also available by the hour. Don't be fooled by the affordability - this is competent, professional training built on many years of instructor training and experience! The Concealed Carry Course is NOT an NRA certified training curriculum. The NRA does not have a concealed carry course for receiving any state concealed carry permit. 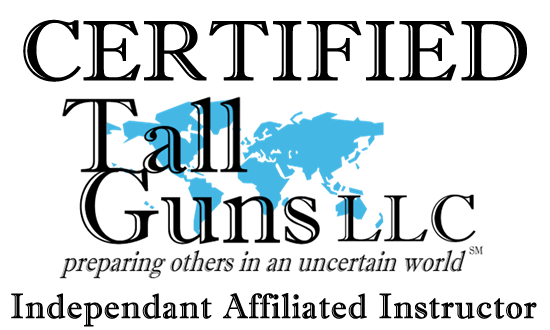 This is the licensed Tall Guns LLC Colorado Concealed Handgun Course presented by Colorado West Firearms Institute. This training is for individuals that have previous experience shooting with handguns. This course is a NON-LIVE FIRE aka SHOOTING class as Colorado Revised Statutes does not require live fire training as a pre-requisite to apply for a state issued carry permit. This course's focus is on Colorado Revised Statutes, Federal Firearms Laws regarding the lawful carry of a firearm and legal use of physical deadly force as it pertains to your specific encounter. It also covers techniques to assess, avoid and react to a situation using concepts of the OODA loop, Basic Situational Awareness, Holster Options and other tools related to defensive considerations. Each student must demonstrate hands-on proficiency with their personal handgun in the exercise of checking for a clear unloaded weapon, then using "dummy" ammunition, load the cylinder or magazine, chamber a round, then unload and clear the handgun. Ballistic comparisons and performance characteristics of most popular calibers. Alternate defensive option when carry is not allowed by law. Options of carry from holsters to "off-body" carry methods such as purses & packs. 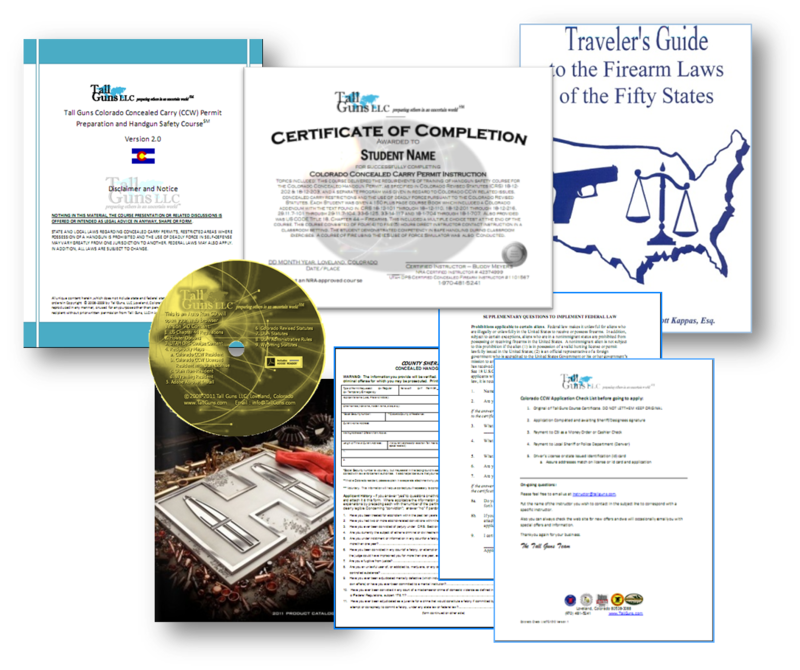 You also get the "Traveler's Guide to the Firearm Laws of the 50 States"
This course is scheduled for six (6) hours but may run longer depending on the number of students and questions during the class. Below is the course material you will receive as part of this class. This course is the same as our single session course except that it is conducted over two sessions. Private training - Call or email for furhter information. This course is NOT an NRA certified training curriculum. This course is for those who are well grounded in the basics of pistolcraft; including mindset, marksmanship, and gun handling. Upon completion of this course, graduates will leave with greatly increased confidence and competence in the effective use of the defensive/tactical handgun. Subject matter is presented in such a way as to progress from relatively simple to complex; this builds the confidence our clients need to take on more challenging skills and concepts comfortably. Competencies that graduates will possess are: safety, the firing stroke, reloading, interdicting and dealing with malfunctions and stoppages, fast and accurate engagement of targets (from single to multiple), shooter movement, low light shooting, and problem solving including shoot/no shoot scenarios. This complete course is 5 days; however we can break it down into modules to accommodate our clients’ needs. Participants will receive a certificate for each module successfully completed and a diploma upon successful completion of the entire course. Clients will use approximately 1000 rounds of ammunition. This training is set by arranged appointment only so Email, Call or Text to setup your training session. This is a very basic seminar regarding personal situational awareness. Topics including awareness of surroundings, rapid threat recognition, and mitigation techniques are discussed. In addition to situational awareness, other topics can be added based on your needs, for example: active shooter response, etc. 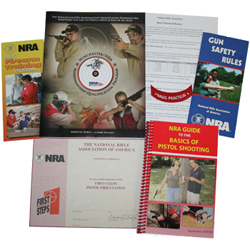 The NRA Basic Personal Protection In The Home Course teaches the basic knowledge, skills, and attitude essential to the safe and effic ient use of a handgun for protection of self and family, and to provide information on the law-abiding individual's right to self-defense. 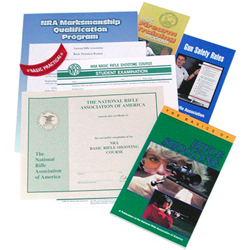 The NRA Home Firearm Safety course is a non-shooting course and teaches students the basic knowledge, skills, and to explain the attitude necessary for the safe handling and storage of firearms and ammunition in the home. This course is especially recommended for families that are interested in exposing their children to firearms. Whether you are wanting to get a firearm or already have firearms in the home, this course is designed to teach expanded fundamentals to those who need it most; your children. As the parent, you will learn the techniques to continue the learning process and to expound the process into shooting later to build on the foundation taught during this class. As you notice in the course bullets below, the focus is on unloading the firearms and not loading or shooting. The most important element of this class is removing the mystery and allowing the ability to learn the proper way to handle and respect all firearms. 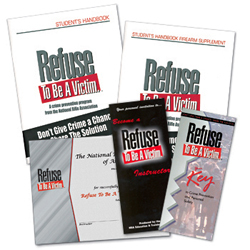 Refuse To Be A Victim is the NRA's award winning personal safety and crime prevention program. During this course, you will be presented with information that will assist you in the development of your own personal safety strategies. This course is for men and women. The only prerequisite for particiaption in this seminar is an interest in crime prevention and personal safety. Those wishing to work as a Security Guard in Colorado must have a valid Security Guard License for the duration of their work. Licensing in Colorado is done at the City level. This course is used as part of the Security Officer licensing process to demonstrate training proficiency in required areas. Use of Force and Reporting. Price is by Module. We offer group discounts as well as multi-module courses for the individual. Call 970-773-0602 or email info@shootcoloradowest.com with questions or to schedule a course. This course is at least three (3) hours long and includes classroom and range time learning to shoot a specific rifle action type. 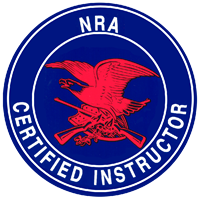 This course is at least fourteen (14) hours long and includes classroom and range time learning to shoot rifles. If selected and used properly, a shotgun is a devastating and versatile firearm. In this course we will show you how to use your shotgun to maximum effect! This training is done in conjunction with Risks Incorporated & International Defense Strategies, LLC. Equipment: Shotgun, Pistol, Holster, Eye/Ear Protection and minimum of 200 rounds of shotgun ammunition and 100 rounds of pistol ammunition. In this course we will show you how to effectively use your carbine for close quarter and medium range defense! This training is done in conjunction with Risks Incorporated & International Defense Strategies, LLC. Equipment: Carbine, Pistol, Holster, Eye/Ear Protection and minimum of 200 rounds of rifle ammunition and 100 rounds of pistol ammunition. Firearms training for armed security professionals including handgun, shotgun, and rifle training. Training for Security Professionals in the use of less-lethal weapons, use of force, and handcuffing techniques. This course is at least 6 hours long and includes classroom and range time learning to shoot revolvers and semi-automatic pistols. Although the Basic Pistol Course will meet the Colorado State requirements for Concealed Carry Training, it is highly recommended that each student take the Concealed Carry Course. The Custom Handgun Orientation will include up to 2 hours Range time. Targets are provided. Eye and hearing protection is available for clients that do not have their own. Basic shooting drills are covered on paper targets as well as multiple steel targets. This course is specifically tailored to each client's specific needs and immediate goals. Our tactical firearms training classes are aimed at professional people and serious tactical shooters who require top quality tactical firearms training. All of our tactical firearms classes are taught in a relaxed, ego free and informal environment. The content of our tactical firearms courses is based on the real world experience, not 3rd hand theories or YouTube learned techniques. We teach simple, proven and highly effective shooting techniques used by close protection and special operations personnel. This means we only teach our students tactics and techniques that work; not Gung Ho theories that sound good in a comfortable classroom! Our Tactical Firearms Training is done in conjunction with Risks Incorporated & International Defense Strategies, LLC. 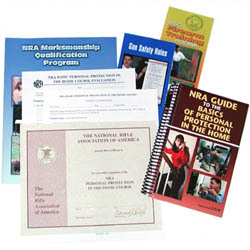 This package includes Tactical Pistol Phase 1, Tactical Pistol Phase 2, Tactical Shotgun, and Tactical Carbine Training. The entire course will require 1000 rounds handgun ammunition, 200 rounds of shotgun ammunition, and 200 rounds of rifle ammunition; handgun; holster; shotgun; rifle; and eye and ear protection. In addition to our public classes we also provide private one-to-one tuition for individuals and groups; let us know your requirements and we will create a tactical training program for your needs. We can also send tactical firearms instructors to your location if desired. In Tactical Pistol 1, we cover the fundamentals of instinctive tactical shooting at close and medium ranges. This training is done in conjunction with Risks Incorporated & International Defense Strategies, LLC. In Tactical Pistol 2, we put an emphasis on instinctive techniques that will give you an edge in hostile situations. This training is done in conjunction with Risks Incorporated & International Defense Strategies, LLC. Our close protection / bodyguard training courses are conducted in partnership with Risks Incorporated and are aimed at serious students who will go on to use the skills taught in these courses. We train both novices and experienced personnel. Our bodyguard training courses are not classroom based seminars. We keep our students busy, as we want to give them the best value for their money. Risks Inc.'s diverse experience enables us to refine our operational and protection training techniques to be the most practical and effective commercial system available. Our bodyguard training courses are very different from those courses offered in other U.S. bodyguard schools in that we do not teach high-profile Secret Service-type or Israeli techniques. The Secret Service has a huge budget, extensive resources, legal authority and the full co-operation of local law enforcement agencies. However, this is often not the case in the commercial environment in which individuals usually do not have any legal authority or a big budget! Our courses are intended for the commercial operative, who aims to provide low profile protection services to clients who are under potential threat. We focus on the subjects that are relevant to those conducting business in potentially high risk environments, where high profile protection techniques would only attract the attention of criminals and corrupt government officials. Students who successfully complete our courses receive Risks Inc. certification. We assess students throughout the course, there is no end of course true or false test. Students are judged on their attitude, ability and whether we would be happy working with them.